We explain exactly what the Open Electricity Market is, and how to choose the best plan from among the bewildering choices. Prices are updated as of 01 March 2019. You might be aware that starting from November 2018, residential households islandwide will be able to pick from a variety of electricity retailers to buy electricity from. For most of us, this can be a little unnerving and confusing, since we have been buying power from just one company – SP Group. With the impending launch of the Open Electricity Market island-wide, Singapore households will be able to choose from 13 electricity retailers, each offering different plans. What does it mean to buy electricity from a company other than SP Group? Will electricity reliability be affected? Is it compulsory to switch? Here is what you need to know about the Open Electricity Market, and an overview of the choices available so you can make the best choice for your household’s needs. In order to understand what an electricity retailer is, we first need to understand how electricity is produced and sold in Singapore. The Singapore energy market has always been an eco-system made up of multiple players. Everything starts with the electricity produced by power plants, which are owned and operated by power generation companies. Every half an hour, these power generation companies bid for contracts to generate and sell specified quantities of power on the wholesale electricity market. Retailers, including SP Group, then buy electricity in bulk from the wholesale electricity market to supply to consumers. The electricity generated is then transmitted from the power plants and distributed across the island on the national power grid, which is also operated by SP Group. In other words, SP Group buys electricity in bulk from the power generation companies on behalf of Singapore households. The company is also responsible for the infrastructure for reliable power delivery island-wide and billing households for electricity consumed. To ensure consumers are protected, prices that Singapore households pay is based on the tariff set by the Energy Market Authority (EMA), with the aim of being as low as possible while allowing SP Group to cover operational costs. The tariff is revised every quarter and consists of two parts: 1) fuel cost and 2) non-fuel cost. The fuel component is based on natural gas prices in the preceding quarter, while the non-fuel component covers the cost of running the electrical infrastructure and support services like meter reading. In effect, the tariff system insulates Singaporeans, to some extent, from the electricity production and purchase process, and from near-term price fluctuations due to the global oil market, since 95% of Singapore’s electricity supply is generated using imported natural gas. The Open Electricity Market (OEM) is part of EMA’s effort to liberalise the electricity market, allowing residential households in Singapore to buy electricity from retailers other than SP Group. Think of this as similar to how different telecommunication companies in Singapore such as SingTel, M1, Starhub and Circles.Life offer different price plans in order to attract different kinds of customers. On 1 April 2018, OEM was soft launched, allowing more than 100,000 Jurong households to choose their preferred electricity retailer and plan. Consumers in the rest of Singapore will enjoy the same choice when OEM rolls out nationwide in phases from 01 November 2018. This will involve 1.3 million mostly household accounts. To be clear, SP Group continues to operate the national power grid, so you can be assured of the same reliable power that you come to expect living in a Singapore. For those who choose not to do anything, SP Power will continue to sell you electricity at the regulated tariff. The opening up of the electricity market for Singapore households come with a number of benefits for Singapore residents. Compared to paying a fixed, quarterly tariff rate which is what SP Group offers, retailers allow you to choose from two types of electricity plans. Different plans give Singaporeans choices on how they wish to buy electricity and who they wish to buy it from. They have the potential of large cost savings for households who choose an appropriate plan based on their consumption habits. Competition among retailers that essentially sell the same product (electricity) means that companies need to provide great service at great prices. Beyond price, retailers are also competing to value-add to their customers. For example, PacificLight is giving customers free 12-month home insurance from Etiqa when they sign up for a 24-month home electricity plan. Other retailers are offering free months of electricity, referral cashback, and other promotional rewards. As companies strive to differentiate themselves, we can look forward to even more offerings and perks, and to choose the one that makes the most financial sense for us. The introduction of OEM and the large numbers of retailers and plans should make Singaporeans more aware of the electricity market in Singapore and to take stock of their own consumption patterns. Being more conscious about when we use electricity, how much power our appliances are using, and areas of wastage will hopefully lead to more considered electricity use, saving both money and natural resources over time. When Will You Be Able To Make The Switch? The nationwide roll-out of the Open Electricity Market will be conducted in phases, based on location. Before we compare the different standard price plans offered by each retailer, it’s important to first understand how each works. In general, retailers offer two types of plans: 1) Discount Off Regulated Tariff, 2) Fixed Price. Here is how each type of electricity plan works. 1) Discount Off Regulated Tariff plans offer a discount off the prevailing regulated tariff price, which is revised every quarter. 2) Fixed Price plans mean you pay a fixed rate throughout the duration of your contract. 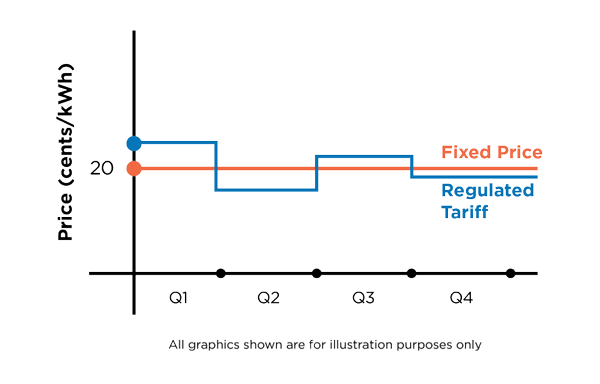 While the rate is not subjected to quarterly fluctuations based on the tariff, it may be higher or lower than the tariff over time. Peak and Off–Peak plans were offered to Jurong residents, but has since been withdrawn when the OEM rolls out nationwide, due to the lack of interest among consumers. Retailers could still offer Peak and Off-Peak plans, but these will be classified as “Non-Standard plans”. Under this scheme, you pay different prices for electricity usage depending on the time of day. If your household’s electricity usage is skewed towards mainly off-peak hours, Peak and Off-Peak plans could potentially result in the greatest savings. * All prices are accurate at the time of writing and might be subject to change. Please contact individual retailers for the most updated pricing. 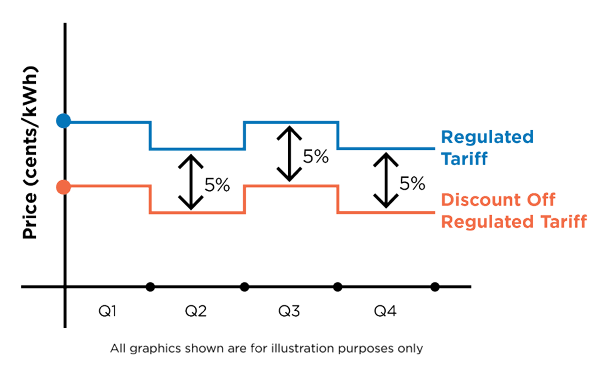 Ohm’s Discount (6 Months) offers the highest percentage discount off the regulated tariff at 25.00% (as of 01 March 2019), with a contract of 6 months. The short contract duration can be a double-edged sword. On one hand, a shorter-term contract frees you up to choose another cheaper plan or even switch to another retailer after 6 months. On the flip side, the discount being offered may not be the same by the time you need to re-contract. For those who prefer longer-term certainty, Diamond Electric’s Sure Save Plus Rebate – RES gives the greatest discount of 24% for 24 months, followed closely behind by ES Power’s GFREEDOM (Carbon Neutral), Sunseap’s SUNSEAP-ONE (1% Solar Energy) 24M and iSwitch’s Super Saver Discount (24 Months) plans, which all give a 23% discount off regulated tariff for 24 months. The absolute cheapest rate (as of 01 March 2019) is Geneco’s Give Us A Try, which charges 17.63 cents/kWh for a 6-month contract. For those who prefer to lock in the fixed rate for the long-term, you can look at Geneco’s Get It Fixed 24, Keppel Electric’s FIXED24, or Sembcorp Power’s 24M Fixed plans, which all charge 17.78 cents/kWh for a 24-month contract. Now that you understand how the various plans work, you might wonder which one suits you best. Here are four steps you can take to answer that question. The first thing you can do is to gather your past electricity bills. Since electricity consumption is generally cyclical, doing so will help you have a more accurate picture of your consumption patterns. When going through your household electricity bills, note the highest electricity usage in a month, and then calculate the average monthly electricity consumed. You can use the following table to help with log your results. To help you along, you can also refer to information on historical tariff rates and compare against the rates on offer. Take your average monthly electricity consumption (derived in Step 1) and multiply that with rates given by the Fixed Price plan that you are considering. This is how much you can expect to pay when you’re on a Fixed Price plan. Adding a column to your original table, you can see if you will be making savings (and by how much). To know how much you’ll be paying if you are on a Discount Off Regulated Tariff plan, look at what you are currently paying for your electricity (which is at the regulated tariff) and factor in the discount percentage given in the plan. Adding a column to your original table, you can see how much savings in dollar terms you would have made. Using the results of both Fixed Price and Discount Off Regulated Tariff tables, you can see which type of plan will result in the greatest savings for your household. If you’re worried about making the “wrong” decision, then the simple sure-win proposition is to go for a Discount Off Regulated Tariff plan. By switching to a retailer with such a plan, you will enjoy immediate savings compared to sticking with SP Group. After you identified what seems like the best plan for you, you can visit the retailer’s website and download the Fact Sheet for the plan (or plans) that you have in mind. This Fact Sheet will summarise the key contractual terms and conditions of the price plan, such as contract duration, payment terms, security deposit, early termination charges and auto-renewal clauses. Another document to look out for is the Consumer Advisory which outlines the important things that you should be aware of before signing up with a retailer. Retailers are required to obtain your acknowledgement before contracting you as their customer. For most of the plans, there is usually a security deposit required, and there are early termination and late payment fees you need to be aware of. As with all contracts, read the fine print carefully and ask the retailer to explain any of the terms and conditions that you are unsure of. In a bid to attract new customers, retailers have been offering referral discounts and other perks. Some of these are limited-time or limited-quantity offers, and they should not be the driving factor for deciding to sign with a particular retailer. For example, DollarsAndSense readers considering a plan from PacificLight can enjoy additional rebates when you sign up online. These rebates are on top of any referral codes, so be sure to take advantage of referrals as well! These promo codes are exclusive to DollarsAndSense and are limited to the first 200 online sign-ups. Existing AMEX cardholders who set up recurring payment for their PacificLight bills (minimum bill size of $10) will get a one-time credit of $40 to their next American Express statement. Terms and conditions apply. Ultimately, choosing your electricity retailer and plan is an important decision that you should make based on your needs.